It’s not every day that Tesla introduces a new model -- the Model 3 is just the fourth, after all -- which is why I was damn lucky to be among the few to experience the sedan at its debutante ball. Plenty has already been said about CEO Elon Musk’s plan to market the Model 3, the remaining puzzle piece in his "master plan" to rethink the electric vehicle (EV), and its affordable $35K price point. Tesla chose not to answer most questions about what lurks underneath the Model 3's skin -- so there aren't any specifics to report with regard to batteries, motors, or materials -- but I did learn more than enough by poking around at the launch event. Is the Model 3 enough to make EV evangelists temporarily disregard a past filled with countless delays and long-term reliability questions? After a short ride in one of the pre-production Model 3 prototypes, the signs are encouraging. Tesla seems to understand what millennials are looking for in luxury. In stark contrast to the costly-but-sparely appointed Model S, the Model 3’s interior feels downright plush. 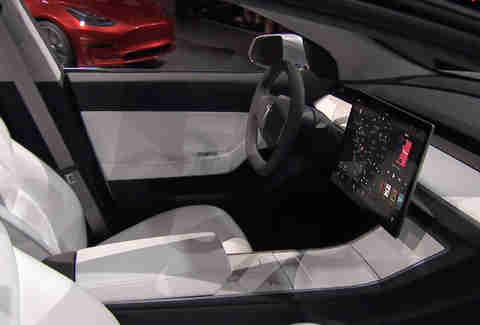 The all-white interior of the demonstration prototype is more Soho than Silicon Valley, featuring seats wrapped in glove-soft leather and a similar material covering the dashboard. You could call Tesla’s approach to interior design minimalist, but even that would be generous: there’s really nothing there. After all, buttons are so last century. It has a cockpit built for, well, not driving. A dead giveaway that this Tesla is meant for autopilot is the center-mounted screen that pokes out of the dashboard like the onboard laptop in a cop car. A high-res screen basking in the interior spotlight is a signature Tesla move, but in the Model 3, that’s everything you get. It’s not exactly a 2018 Toyota Echo or Nissan Quest, which also had instrument panels in the middle, but the concept is similar. Without traditional gauges mounted in the driver’s field of view, the Model 3’s interior was clearly designed without a driver in mind. Even the steering wheel, which is more of an oblong discus than a round wheel, seems more like a utilitarian tool than an instrument of pleasure. I didn’t have a chance to see what the screen can really do besides provide readouts for speed and navigation, but it's a Tesla, after all: clever things on widescreen display are a given. The front seats are wide, and the back seat was wide enough for two people, and a third, thinner person would have good knee room but not a lot of hip room. One last point on the interior: the materials that you don't constantly touch, like the door panels, the window switches, and the center console, didn't feel high quality. This was a prototype, though, so I'll cut it some slack there. The overall look of the Model 3 is stubby from the rear, and the whole front area looks scrunched in, almost like a Mitsubishi Mirage and a Ferrari California had a very, very strange night together. 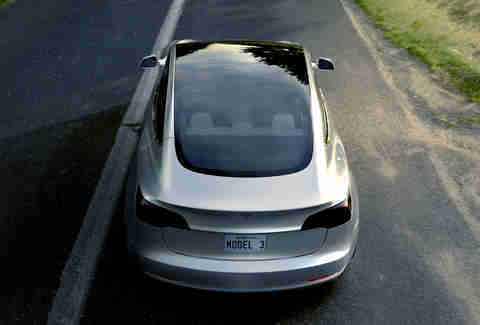 The frunk (that's Tesla-speak for front trunk) seems big. The trunk in back -- which I tried to open but was quickly rebuked -- does not. The door handles are also pretty weird, and not in a good way; a departure from the "old" Tesla handles that emerge as you approach, they push out from one side after being clicked. To my eye, it's not a beautiful car, but neither was the Model S, really. Is the hatch-style shape for aerodynamics? Who knows? 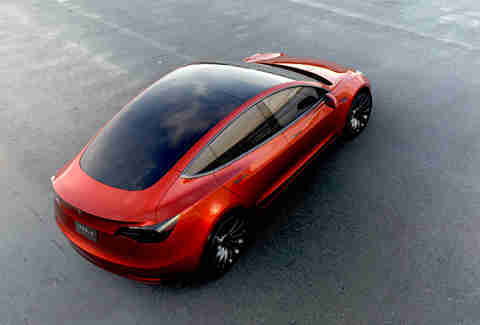 At this point, all we can safely say is that it's a natural extension of Tesla's winning design theme. 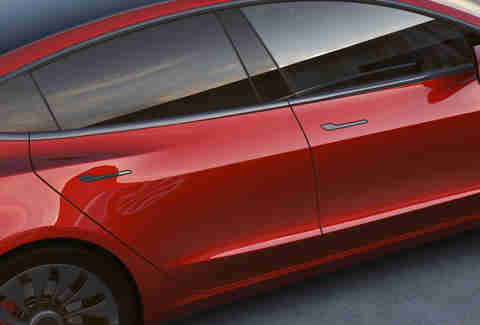 The Model 3 is certainly a vehicle to be seen in, given the sheer amount of glass that surrounds its occupants. To me, the roof felt strange; it needs a shade. The engineer-slash-test driver chauffeuring me around confirmed that some Model 3s will have sunroofs instead. That's a major point, since glass roofs are typically quite heavy. 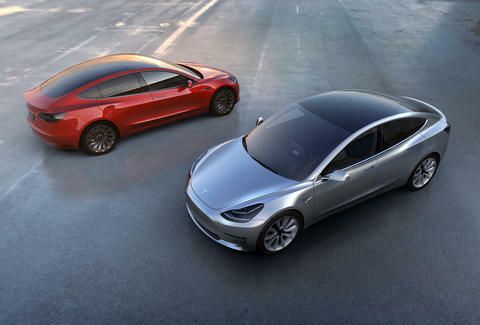 Tesla representatives did not confirm whether the Model 3’s single glass roof panel was as big as the windshield of the Model X, which Musk claims is the single largest piece of glass in use on a production vehicle, but it's still pretty large. Will the acceleration melt your face like its Ludicrous big brother? No. Sorry, drag racers. The dual-motor prototype of unknown battery size and motor output that I rode in was not a rocket like the P85D and P90D have proven to be. Instead, expect the same sensation that you’d get in a typical electric car, like a Kia Soul EV or Fiat 500e, at least in the base model. It certainly rides like a regular car. The quick evaluation course was rife with imperfections in the road, and the Model 3 quickly showed its prototype roots -- even this one that was supposedly equipped with an advanced suspension. Instead of soaking up the bumps like the Model S and Model X do, the Model 3 allowed plenty of vibration and harshness to come into the cabin. It is not a game-changer -- yet. It would be easy to jump onto the hype bandwagon and proclaim that the Model 3 signals a revolution, but that's just not true. The Nissan LEAF offered an affordable electric car with reasonable range almost a decade ago. Chevrolet is about to introduce the Bolt. For the Model 3 to truly change the game in EVs, Tesla will have to prove that it can sustainably build and service a mainstream, high-volume vehicle, like Nissan did, while keeping prices affordable. For the Model 3 to have a significant impact on the mass market, it will have to perform better than a wide-reaching competitive set. The ball’s in your court, Elon. Jeff Jablansky is an automotive journalist, and is understandably leery of a world without steering wheels. Silently follow him @unclewithcars.